Get your water rates refund/reduction. ...or work part or full time to build your own business. Why rely on employers who let you down when you can take control of your own future? It’s a website that shows a real-time display of the air pollution from the incinerator at Javelin Park if it existed now. What air pollution? The Council said that the incinerator would be "clean, green and affordable"! A typical incinerator produces as much pollution (in terms of oxides of nitrogen and particulates) as a 5-7 km stretch of typical motorway, according to the government’s pro-incineration document: Incineration of Municipal Solid Waste. Why did you create Plume Plotter? As a Kingsway resident, I was curious about where all this pollution would end up. It’s hard to imagine being downwind from a 5-7km stretch of motorway, but it’s quite possible to be downwind from an incinerator. If the wind is blowing from Javelin Park to Kingsway, as it often does, it might be worth knowing about it. 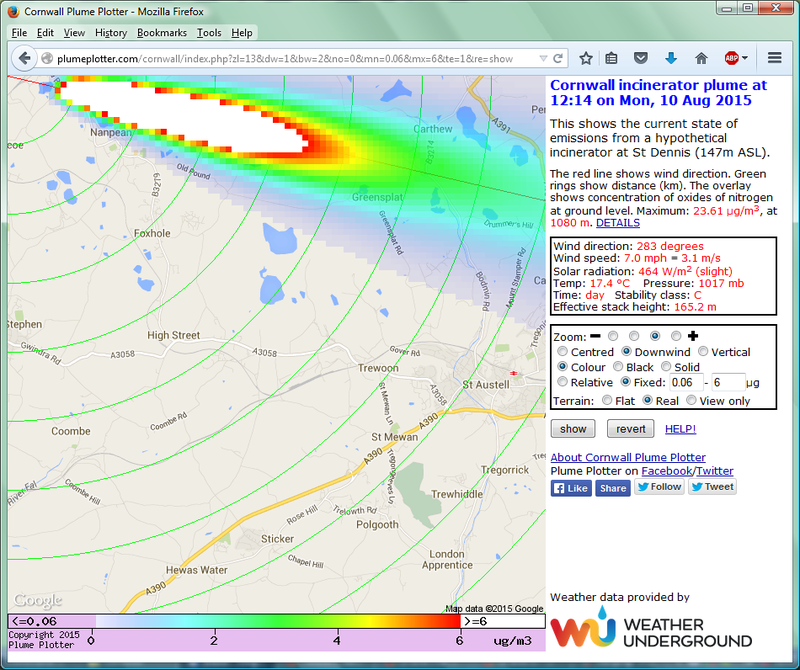 Does Plume Plotter just show the wind direction then? No, there is more to it than that. I didn’t know whether Kingsway would be affected even when the wind is from the South-West. Maybe the pollution would be dumped on Haresfield or rain down on Cheltenham or Scandinavia. So Plume Plotter calculates how high the plume rises and how it disperses with distance. The display shows how much pollution reaches ground level at each point on the map. So what is the answer? Where does the pollution go? See for yourself, at: Plumeplotter.com. OK, so we can see where the pollution will be, but is it significant? The air is already polluted by traffic and barbecues, etc. That’s why, as well as showing the amount of each pollutant, the website compares it with the background level. For example, if Plume Plotter shows 50 micrograms per cubic metre of nitrogen dioxide at a certain location, this is 327% of the background level in the Gloucester area, so the predicted level there right now is more than four times the average. How accurate is Plume Plotter? No model is completely accurate, and Plume Plotter is based on a simple model which is definitely not the state of the art in air pollution modelling. I don’t have access to the latest software, which costs £1850 per year. No, Plume Plotter is objective and unbiased. Anyone can see how it is implemented and point out any errors. If anything, Plume Plotter is incinerator-friendly, because all data about the incinerator and its emissions is taken from the incinerator application documents: Prof. Howard stated that these underestimate PM2.5 concentrations by a factor of up to 100. If he’s right, Plume Plotter probably also underestimates the pollution. Why did you release Plume Plotter online? Because I guess I’m not the only one who had no idea what effect the incinerator would have and I believe it’s important to understand as much as possible, before it’s too late. I hope Plume Plotter will contribute to this. Share post Posted Sunday, April 5th, 2015 at 3:08 pm under Local News, Refuse & Recycling. The “smog spewing monster” will be fired up soon, but there seem to be no air pollution monitors (official or amateur) anywhere near Kingsway. The nearest are in Bristol, Chepstow, Coventry, etc. Therefore, I’ve set up a simple pollution (PM2.5) detector at Plume Plotter HQ in Kingsway. The readings can be viewed online at http://plumeplotter.com/monitor/ or follow @AirKingsway on Twitter. Here is the first plume of Christmas: the animation for January 2015. Look out for the 12 plumes of Christmas: animations of the Gloucestershire incinerator plume for each month of 2015. These will be posted on each of the 12 days of Christmas, on Plume Plotter’s Twitter, Facebook, and Youtube pages. Just released a new version of Plume Plotter. This one is based on AERMOD, one of the most famous modelling systems (from the US EPA), so its predictions should be quite accurate. See what you think HERE. Also, please feel free to follow Plume Plotter on Twitter and like Plume Plotter on Facebook! Until now, Plume Plotter has assumed a flat earth, showing pollution reaching the ground at the same height as the base of the incinerator. However, all incinerators modelled so far have at least one hill nearby. Uphill places may be more highly polluted, of course. Therefore, Plume Plotter has just been extended to model the terrain, using digital height data from OS. The default is still “flat”, but you can select “real” terrain by clicking the appropriate button. To see where the hills are, use the new “view only” button: this plots the height of the terrain itself, rather than the plume. Thanks Dave. I thought of advertising Plume Plotter on the “Kingsway Big Lunch – Community Wall”, but on second thoughts it would be too depressing for the occasion! Great article on Plume Plotter and a useful tool to get an idea of how the Incinerator will effect everyone in the area. Great work Ash. Ha, sorry about that, it should have be in the ‘News’ category too (fixed now)! I see it is ‘registering’ this morning (after a few quiet days). By the way, there are light winds forecast this week. If Plume Plotter shows the message “No pollution”, it means that there is no wind and the pollution doesn’t go anywhere, so please try it again when the wind picks up. Thank you for this Ash, Plume Plotter is a fabulous piece of work by anyone’s standards, and thank you for the article too. I hope that it helps more local people to understand the situation we’re likely to be in if (as seems almost certain now) this thing is built. There is a facebook page created for Plume Plotter now… HERE. Zainab Orooq on Kingsway Broadband Issues? Clive on Kingsway Broadband Issues? Suresh V on Kingsway Broadband Issues?